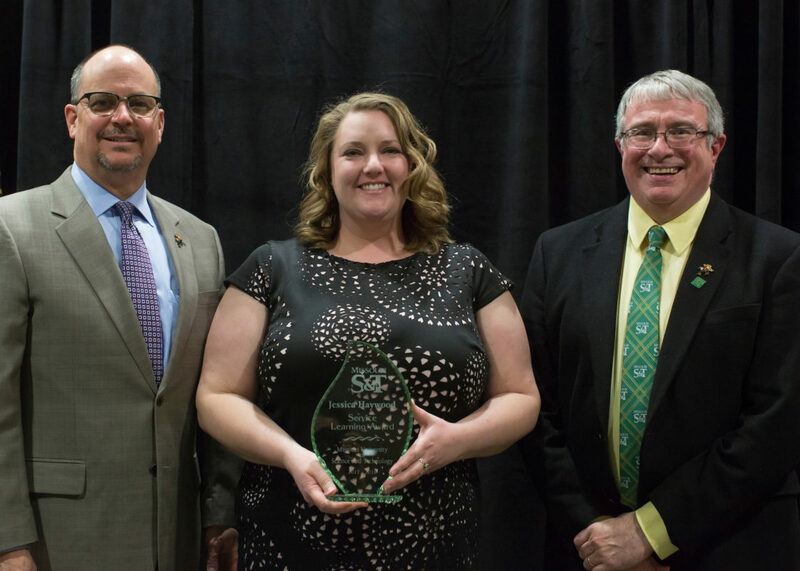 Jessica Haywood, program administrator for volunteerism and involvement, receives S&T’s Staff Service Learning Award on Feb. 13. From left, Provost Robert Marley, Haywood and Interim Chancellor Christopher Maples. Dr. Stuart Baur, Jessica Haywood, Dr. Daniel Oerther and Dr. David Westenberg received awards for their roles in campus service and experiential learning. They received the awards from the office of academic support during a ceremony Feb. 13 on campus. Baur, an associate professor of civil, architectural and environmental engineering, received the Faculty Experiential Learning Award. Baur was recognized for combining learning beyond the classroom with hands-on community service projects, including leading a project to have students create designs for a proposed new animal shelter in Rolla. Jessica Haywood, program administrator for volunteerism and involvement, received the Staff Service Learning Award. Haywood was recognized for her work with the Miner Challenge Alternative Break program. Miner Challenge gives students opportunities for immersive volunteer experiences across the United States and abroad. The program helps students develop leadership skills and increases their awareness of social issues. Oerther, a professor of civil, architectural and environmental engineering, received the Faculty Service Learning Award. Oerther was recognized for his work with the U.S. Department of State Diplomacy Lab. The Diplomacy Lab is a public-private partnership that allows the State Department to “course-source” research and innovation related to foreign policy challenges by harnessing the efforts of college students and faculty experts. Westenberg, an associate professor of biological sciences, received the Faculty Experiential Learning Award. Westenberg was recognized for his work co-advising the iGEM student design team and for his work in supporting the research of students involved in the Opportunities for Undergraduate Research Experience (OURE) program.